Is there something wrong with me? Does anybody else suffer from this problem? Let me back up. Throughout my entire life, I have eaten and enjoyed eggplant. 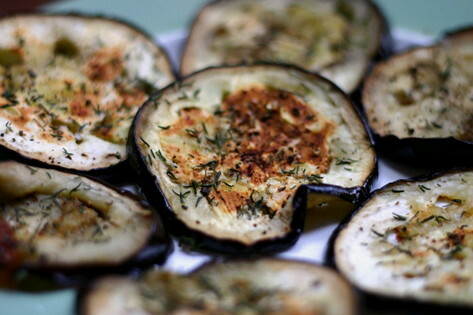 I recall one day at my old apartment, I proposed cooking an eggplant dish with then-roommate Erin. She said she was allergic to eggplant — “It makes my mouth itchy.” Well that’s unfortunate, I thought. 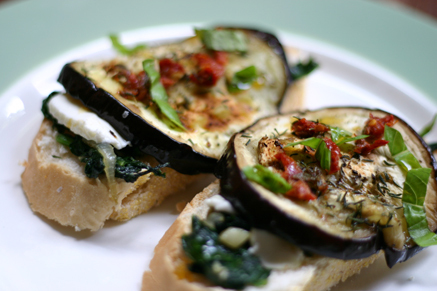 Then today I made this baked eggplant, sauteed spinach, fresh mozzarella and sundried tomato crostini, and found myself smacking my mouth afterwards, annoyed by this fuzzy, tingly itchy feel on my tongue. The eggplant itchy mouthfeel syndrome! Did Erin pass it on to me by co-habitation? Does one acquire it with age or with increased eggplant consumption? Whatever it is, what a total bummer. Truth be told, the itchy feel wasn’t so unpleasant that I couldn’t go on with my evening and forget about it completely after some drinks. I’d say it lasted a couple of hours. Also, I was drinking white wine along with this dish, and wonder if the alcohol could have possibly agitated whatever chemicals were going on in my mouth or dried out my tongue too much. Aside: If you’re wondering why these photos look eight times more sophisticated than my usual ones, it’s because I stole my boyfriend’s digital camera to snap them while he was out (and since I left my camera at someone’s house). Ben recently got a new lens, too, and is very excited about having the same camera and lens as “the Smitten Kitchen Lady,” aka Deb. I know — Hooray, finally an upgrade! Well, I don’t know how long that will last. I barely know how to hold the thing, so consider this post a rare visual treat. I don’t have the itchy mouth, but came looking for information because I cough when I eat eggplant, almost like I’m choking on something. Mild though, not enough to make me stop eating it, but it did make me wonder if it was the eggplant or just me. The blog is very interesting. If you salt eggplant (after chopping into rounds), it will ooze out some juice after a few minutes. Wipe away this juice with a paper towel before cooking the eggplant. I find this technique cures my itchy mouth reaction to eggplant. This was an interesting read, thank you. My daughter and I both got itchy lips after eating loads of eggplant when there was a big harvest. Btw, my reactions to various allergens went down to almost nothing after applying glycobiology science (see TED talks on you tube) and finding a good source for them! Thanks so much everyone from sharing your experience. I’ve never been allergic to anything, but last night after visiting a friend place and having salted egg plant fries (dipped in honey), I think I might. My lips have already been very chapped this season. But anyway, minutes after leaving their house I put some chapstick on and my lips started burning and itching alot. I scratched and it got worse… When I got home my lips were slightly swollen and I had bumps. I started freaking out because I thought they were cold sores, and that I might have picked up herpes 1 from drinking out of my friends glass. (I even called and asked if he and his girlfriend had cold sores, lol). But my mouth looked different from the gooogle images. Anyway, I took some ib profeoun, aspirin, ate and apple, drunk some water and went to sleep. When I woke up most of the swelling was gone, but its still currently itching. so I’m going to take some of the advice here and go to the store.. I plan to get benedryl, acidophilus, detox tea, and l-lysine just in case. Oh and my reaction to the eggplant was delayed by about an hour I believe. And I’ve had the symptoms of very itchy mouth for about 12 hours now. I grow in SouthEast Asia. Back in my old country, almost every time after eating eggplant my mouth area and lips would be so itchy it would later on be a little bit swollen. It was an issue but it didnt stop me from eating eggplant up to my days here in the US. I have experimented myself, by changing the way I prepare eggplant. The interesting discovery I made was I dont have much swelling and redness when it’s peeled. Hello mates, fastidious article and nice urging commented here, I am genuinely enjoying by these. Well I see that am not the only one and reading through everyone’s comments I agree…I find sometimes I can eat eggplant and it dosent bother me while other days it makes the top of my mouth numb and tingled as well as my throat. I really do feel its the skin for me and how long I cook it for. Sometimes I buy this premade frozen eggplant meal in sauce which i cook for an hour in the oven and I never have issues if i eat it this way. While today I went and brought some frozen eggplant cutlets I cooked them for 15 mins like the directions said too and my throat and roof of my mouth are numb. I guess I would just recommend longer cook times and removing the skin…. I have known I am sensitive to some types of eggplants for a long time, same symptoms as above. This last week I ate some, because I love them and was willing to take the chance of it being a kind I was not sensitive to. Well, was I wrong, I am a mess!! Face and eyes are swollen, I have welts all over my body, and I am so itchy I can barely stand it. This was on Sunday evening and this is Thurs morning. I have had a kenalog injection, but the symptoms got worse, so now I am taking oral prednisone, ativan for itching, and supplementing with claritan and benadryl. I am freaking miserable…lesson learned!! I get a choking sensation and a cough from eggplant. It is either an allergic reaction, or some kind of pH balance like an acid in the egg plant that causes this . Because of IBD, I have been on a low-FODMAP diet for more than one year. During this period I didn’t eat eggplants but not for reasons related to diets. You must know I have downsized my pans and am cooking a lot at home. So, basically, I prefer smaller stuff like carrots, leaves, tomatoes, zucchini and the occasional capsicum. So I had sort of “forgotten” eggplants. Today I found some lebanese eggplants and thought “why not? They’re allowed”. So I cut them in circles and shoved them in the oven with tofu, while I cooked red thai rice in a small pan. Now I have just assembled all those cooked ingredients and ate a small piece of eggplant. This prompted a reaction on the top of my mouth… like burning. But it was not the heat. And I was surprised. Then I felt a bit heavy in my stomach, but that’s about it. Problem is they are still unsure if my problem is IBD or allergies (like my mother before me). So here I am on this page… and am surprised to see it happened to others. I am not sure I want to eat that dish right now. But maybe I’m just anxious. I’ll put them by the side and have some later. Maybe I just need to get used to them again. I experienced the same thing but the only difference was I didn’t actually ate the actual piece of eggplant, I just sipped the stew made by my friend which unfortunately has an eggplant on it. Immediately after sipping I felt my lips were thick and started scratching them. I see you posted this a while back, but still enjoyed it & the comments. Eggplant burns my toung, & was courious. I was researching this and stumbled upon your post. Since I remember I have never been able to eat eggplant because my mouth feels like it’s burning and my tongue gets swollen. I couldn’t even tell you what an eggplant tastes like because the moment I eat it all i can feel is the burn. I would love to discover a way to finally be able to taste it without the discomfort. Oh well, at least now I know I’m not alone seeing how no one believes me when I tell them what it does to me. The skin contains something similar to latex. My experience has been people with latex allergies are also sensitive to eggplant. after not having egg plant in many years. My mouth and tongue reacted, itchy, burning and swollen. I thought I had thrush. So I ate more the next night! Serves me right, I should have seeked information after the first meal. I grew Endirne Eggplant one year. They were beautiful eggplants. Brought them to my parents house, grilled them and we all started to eat them with our dinner. ALL OF US felt like we were eating fiberglass. 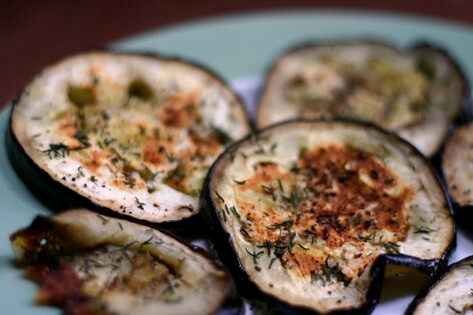 The weird thing is I had eaten this eggplant one week prior and it was no problem. My gut tells me something in the chemistry of those eggplants changed. Was it they didn’t get enough water to that week ( like when cucumbers turn bitter)? Who knows? I get similar reactions, Sores in the mouth and next day some red swelling on face. I had the super-itchy eggplant mouth since childhood through my twenties or maybe even thirties? I ignored it and kept eating eggplants. 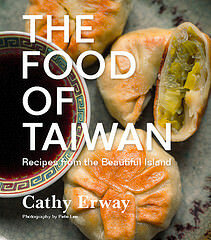 With tine the episodes were fewer–not each time I ate them. I think I may have outgrown it! Or my immune system no longer reacts to it. Can’t even remember exactly how it felt, except it was super itchy, where I wanted to rub my mouth to get the itch out. I have experience this same thing! When I was younger I had no problem with eating eggplant, there was no itchy feeling when I eat it. But now, I started getting this itchy feeling in my mouth whenever I eat it, it started about 2 years ago… But it goes away after a while. My mom didn’t believe me when I first said this to her. I’m currently suffering from one again after eating eggplant (wasn’t careful eating my veggies). I have no problem eating it as long as it doesn’t touch my lip and mouth area. Meaning if I wanna eat it, I have to make sure it is directly placed inside my mouth. I can however eat those that are made as an omellete just fine, probably because my lips are not touching the eggplant part directly. I’ve had this reaction to eggplant now for over 20 years. I stop eating it for 12 months or more and the symptoms seem to go away for a while but return quicker each time I take a break and symptoms seem worse. A few days ago I picked up some baba ganoush to smell it and my lips swelled, which hasn’t happened before – I’ve normally had to eat it before symptoms occur. I’m thinking I should probably talk to my doctor. I only had eggplant once. I got this metallic taste in my mouth when I ate it. I couldn’t eat it and sent it back. I hoped I’d find an answer, but not even Google is helping. Sometimes I can eat eggplant with no symptoms, I have never figured out why. From googling I see it could vary with the season, or maybe ripeness, or maybe by salting to draw off whatever causes it. None of the other nightshades (potato, tomato) bother me. Walnuts and pineapple are fine for me when NOT raw; spinach is worse when cooked. Oh, and for some reason, apples combined with uncooked walnuts (Waldorf salad) is delicious but seriously magnified torture. But walnuts, in say turkey stuffing, not an issue and totally yummy. Mind you, these symptoms haven’t prevented me from eating any of the above. I mean, who can resist fresh pineapple? I just quit when it hurts too much, and then try to ignore my stinging tongue for a few hours. I’d say the symptoms have been more or less the same throughout my life. The amusing thing is that four decades ago I didn’t even realize it happened with eggplant. When Baba Ganoush got popular with most of my friends i couldn’t understand the appeal. It took me years to realize that I didn’t like it because it hurt! But there is an Afghan restaurant in Philly that serves a very finely sliced eggplant hors d’oeuvres that hasn’t ever bothered me…. Hi! Tonight my daughter had cooked a meal, and I wanted to taste what she had cooked up, knowing only that it was vegan. After I had a mouthful, I could feel my body preparing itself for a potential vomit. I went to the bathroom and had to expel excess saliva. After about 5 minutes I returned to normal (did not vomit, but came close) and asked her if her dish had eggplant in it. Sure enough it did! I now know I’m allergic to it as it is the second time it has happened when I ate eggplant. I literally only had a mouthful of pasta with a vegan sauce, and it was enough to set me off. I didn’t experience the itching mouth or throat, so it has been interesting to read the other comments as I was hoping to see if someone had the same symptoms as me. So, no more eggplant for me from now on! Several years ago I ate some eggplant pizza which I had often enjoyed before. A few minutes after eating my body gave all the signals of being about to vomit. I got cold, my mouth filled with saliva, my gorge got tight, I began to retch. I did throw up but just barely. Over the next few years I probably ate it four or five times with no problem, thought it had been a one time thing. In the last few months I’ve had eggplant four times and had the same reaction instantly, from just one bite. I wasn’t throwing up but felt like I should. Cold sweat, excess saliva, retching, same symptoms. One of the times I ate twice baked previously frozen moussaka with no ill effect. I don’t understand it, I ate eggplant all my life. The last three tries were unsuccessful, guess I’ll have to give it up. Maybe really really overcooked, it would be OK, but I don’t think I want to risk it. When I eat eggplant my chest and shoulders ache. Also, my throat feels very swollen when I eat eggplant. I also have this reaction to pineapple, mango, and kiwi I am wondering if they all have something in common. Luckily my symptoms don’t stop me from eating these delicious foods. I can relate to the person that mentioned geographic tongue. I went to an event last night, ate some baba ganoush and felt the familiar itchy mouth feeling. Then I had a pineapple juice and rum cocktail and felt like my tongue was being burned off by acid– a most uncomfortable feeling. I get the same thing when I eat walnuts. Everyone else I know seems to eat these just fine! It’s slightly annoying, but as long as I don’t have the chance of a scary reaction down the road, I will continue to eat eggplant. I do find that cooking it down really, really well helps, and eating Asian varieties, as opposed to globe eggplant. I get a bitter, itchy ,metallic taste when I eat eggplant …sometimes. I noticed that when an eggplant has no seeds, like Asian eggplant, it doesn’t happen..My mom used to salt eggplant and weigh it down in a colander to subtract the bitter juices. Many recipes call for this prep . Perhaps its not a personal allergy but a side effect from eating a bitter eggplant.